Day 2: Check the Sky (Redux)! Home > Day 2: Check the Sky (Redux)! Today’s shift on Mopra (during which I finished up the day 1 post), started with the telescope stowed to protect it from wild storms in the area, with lightning striking within 9 km every minute or so. The backup generator was running just in case the power went out, and the computer had locked the user controls so I couldn’t start observing even if I wanted to attempt to see through those thick clouds. The wait ended up being more than an hour, during which I worked on those sky checks from yesterday. Fortunately, all is quiet at Mopra now, and the Milky Way is visible on the webcam against a perfectly clear sky. It looks like it will be a perfect night of observing for the overnight team. 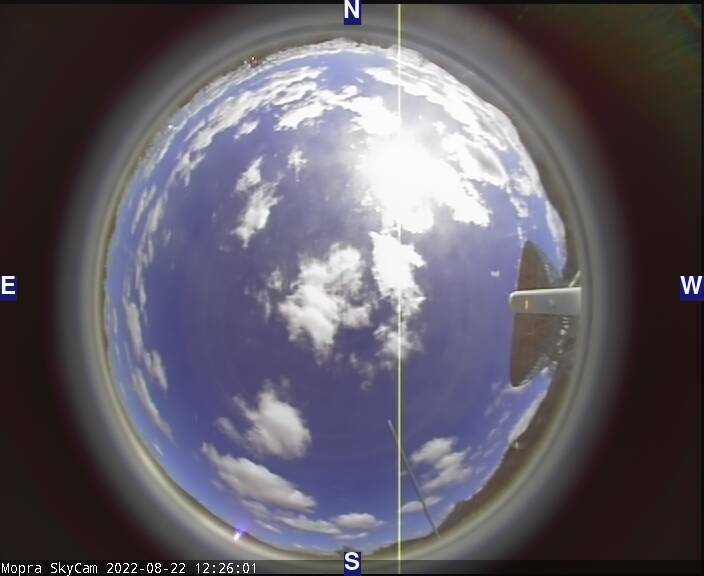 Previous Post: Day 1 of Observing: Check the Sky!